The Italian capital, Rome, is home to a vast array of architectural marvels, meshing the wonders of the ancient Roman Empire with the modern architecture of today. This unique blend is one of the reasons why millions of visitors flock to Rome each year. How you choose to experience it, be it on a Rome motorhome rental, RV or campervan hire or otherwise, will make it one of a kind. Because Rome was considered the centre of the world for some time, the ‘Eternal City’ and the surrounding region offer visitors an incredible amount of history. To truly get a feel for its architecture, life, and culture, a motorhome rental in Rome is essential. This frees you up from the typical restrictions of travel. There is no need to deal with private car hires, drivers, or even pay for a hotel. In fact, in taking advantage of a motorhome hire in Rome, you’ll have easy access to everything you need, wherever you go! After picking up your campervan hire in Rome, and getting yourself situated at a nearby campsite, you can visit some of Rome’s most world-renowned sites. Tourist heavyweights within the city include the Colosseum, the Pantheon, The Vatican, and the Sistine Chapel. There are a handful of fantastic campsites that are close by: A simple bus ride into the city makes for a great sightseeing trip while enjoying the perks of beautiful countryside living by Rome campervan hire. Staying just outside the city is also beneficial because Roman streets tend to be extremely narrow and aren’t a great fit for campervan driving. While some sites will allow you to drive the Rome motorhome Rental to them, others may require that you leave your camper hire at a special parking area. For this reason, it is often easier to park your motorhome or recreational vehicle (RV) rental in Rome at the camp site and travel via public transport into the cities, towns, and villages. Once you’ve covered Rome, it’s time to see the surrounding area and really put your Rome RV rentals to good use. Tivoli, about 40 minutes northeast, is a great day trip from Rome and boasts fantastic gardens and scenic views. Its architectural pride is Hadrian’s Villa, a UNESCO World Heritage Site, where Emperor Hadrian used to retire away from the politics of the capital. With your camper rental in Rome, You can also explore roads travelled by the ancient Romans by taking the Via Appia Antica to experience the catacombs at Parco Regionale Dell’Appia Antica. There are a number of different camping sites around Rome, as well as out towards Tivoli, so you’re sure to find a site that suits your needs and allows you the time and space to look around the towns and villages of the area. 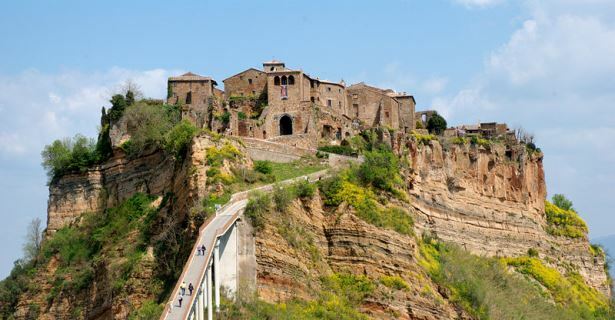 You can also head out to Lazio to the southeast, a mere one hour and twenty minute drive from Rome. Take true advantage of your Rome RV rentals by cooking up some local ingredients for breakfast while out in the countryside. It’s a fun way to save a little money while also experiencing a bit of Italian life. Northern Lazio offers a vast array of landscape for lovers of the all-natural. Green hills and sparkling lakes litter this region, making it wonderful not only for a day trip, but a camping stop. Tarquinia and Cerveteri are small UNESCO-protected towns with pre-Roman history and well worth a visit, particularly for the thousands of Etruscan tombs and large-scale wall paintings that lend insight into Etruscan daily life. Viterbo is another notable small provincial town featuring extant 11th century city walls. If you’re looking to get away from civilization, both medieval and modern, you can drive your motorhome rental in Rome out to one of Lazio’s beautiful lakes Braciano, Bolsena, and Vico before leaving your Rome motorhome rental or campervan hire in designated pick up points.